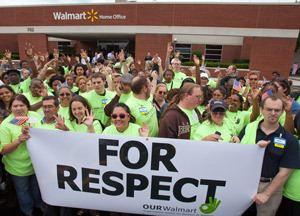 Walmart Workers Strike or Publicity? New Orleans Some eighty-eight (88) Walmart workers have walked out of 25 odd stores around the country according to the UFCW and its Walmart organizing project director, Dan Schladerman. The Times, Wall Street Journal, and other parts of the financial press have played the worker action as a strike and as the first strike against Walmart in its 50 year history. The company has said, essentially “Phooey!” and derided the whole thing as nothing more than a “publicity” stunt. Does it matter? A reporter from the Guardian called me to ask if this was the first walkout ever at Walmart. No, of course not! Workers have gotten wild hairs and hit the streets en masse many times. No one who has spent any time organizing Walmart workers hasn’t heard about such incidents, but this is true of workplaces almost virtually everywhere. Organizers always listen for – and hear! – of past struggles. All of that though is hardly the point. For sure, this is the first time that the UFCW chose to organize workers in some of the small number of stores where it has established small beachheads to walkout in support of a protest against the company, and that’s what is important here. I have also heard some reports now that we are several weeks into this that workers in a few stores have protested independently, which not only proves by earlier point, but is a hopeful sign for the UFCW for the future. The real story here that seems to be missing in all of the financial press, and is very important, may speak to an important shifting of strategy and targeting by Schladerman and the UFCW, which could be significant. All of this activity was prompted by a protest and walkout in Elwood, Illinois at one of the largest Walmart distribution centers in the country. Workers there had signed petitions protesting working conditions and demanding a living wage from a Walmart contractor. The contractor, Roadlink, fired the workers in retaliation. This week the workers were reinstated with full backpay and other reports indicate that Walmart forced the company to make other improvements for the workers with safety protections, shin guards, and so forth. A rally by hundreds at Elwood turned in a 100,000 petition signatures in support of the workers before the reinstatement. This is a clear victory, and what the mainstream stories seem to have missed is that the other protests were largely in support of the walkout and workers at Elwood, and that the “stores” included workers from other distribution centers. All of this matters. Walmart labor relations officials in Bentonville are smart and savvy. Their contractor in Illinois massively screwed up, creating an obvious labor law violation by firing workers for concerted activity. Schladerman and the UFCW to their credit jumped on this miscue like dogs on a bone, since all of this walkout activity now is protected “concerted” activity under the NLRB and the equivalent of a quarterback getting a free pass after the defense was offside if the officials didn’t stop play. Walmart knew its contractor had cooked their goose and that no one would understand the difference between them and their contractor, so muscled up and got folks back to work. Given the laziness of the press and the virtual absence of a sophisticated labor press, Walmart was able to do this virtually unnoticed, catching a huge break. The heart to pressuring Walmart is its distribution system. For years the UFCW was simply ceding the distribution warehouses to the Teamsters. When we worked on the Merced, California project over the years, the Teamsters they were a great ally locally for our campaign, but we were never able to convince the IBT’s Warehouse division to let us go after the other California distribution centers where we had found interest and unhappiness. If Schladerman has finally gotten a handle on this and a clear path to organize and agitate in this area for UFCW’s campaign, then he finally at long last has some bullets in his gun, and he’s fired the few he could load in recent weeks. So, sure, this isn’t much of a strike, it’s not the first walkout, Black Friday is in no danger, and it’s not particularly historic, but it is great publicity and it communicates to a million or more Walmart workers that there might be a heartbeat in the UFCW and its worth a listen, look, and maybe some action in the future. The Detroit sit down strikes did that, too, remember? That’s not this situation, but if the UFCW is in the warehouses now and doesn’t make the mistake of going traditional, but instead doubles down on its “majority unionism” program, as we did several years ago, and moves to sign up a couple of hundred thousand members and keep agile and ready to respond to the breaks that come their way, then, yes, this could be the first call for history in the making.